Four-color process printed on both sides of uncoated 90lb White Hopsack stock. Two sets of H4 business card slits on right pocket. 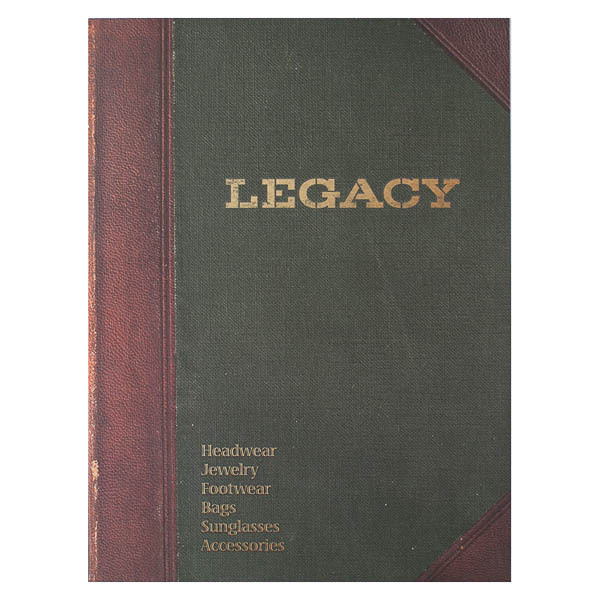 Legacy Athletic promotes its various apparel accessories with this design, which is printed to look like an old book. Its green panels appear to be the texture of a linen hard cover; brown borders and corners resemble worn leather binding. Gold stencil lettering in the brand logo mimics a gilt book title, while the interior's plaid panels top off the old-fashioned design. 2 PMS colors printed on Side 1 using heavy coverage. 1 PMS color printed on Side 2 using heavy coverage. 14pt C1S Semi-Gloss stock coated with Spot UV. H3 business card slits on right pocket. Swirling vector illustrations play up the "sky" in Skybridge Lofts with a whimsical cloud pattern. 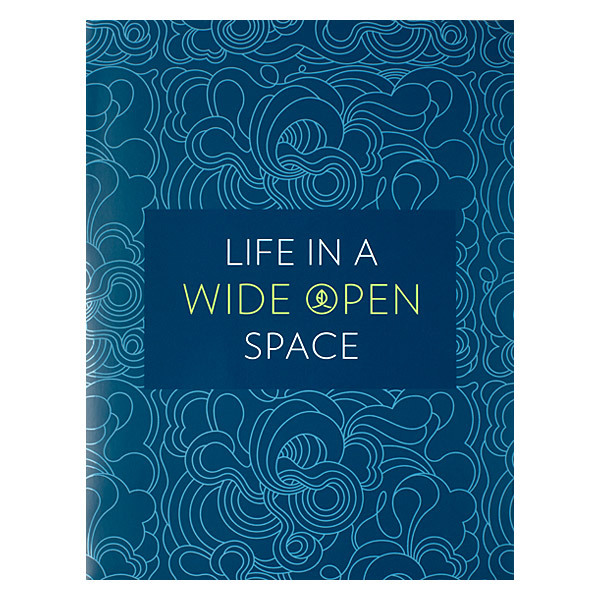 A solid blue square makes the open space community's tagline readable; green text emphasizes its eco-friendliness and the logo hidden in the letter "O." The logo reappears on both interior panels, so customers will see it when removing documents from either sky-patterned pocket. The swirling design also surrounds Skybridge's contact information and partner company's logo on the back cover. Four-color process printed on Side 1 of 14pt C1S White Semi-Gloss stock. Coated with Aqueous Matte and spot BioPlus UV. V1 business card slits on left pocket. Spine attachment in matching stock. 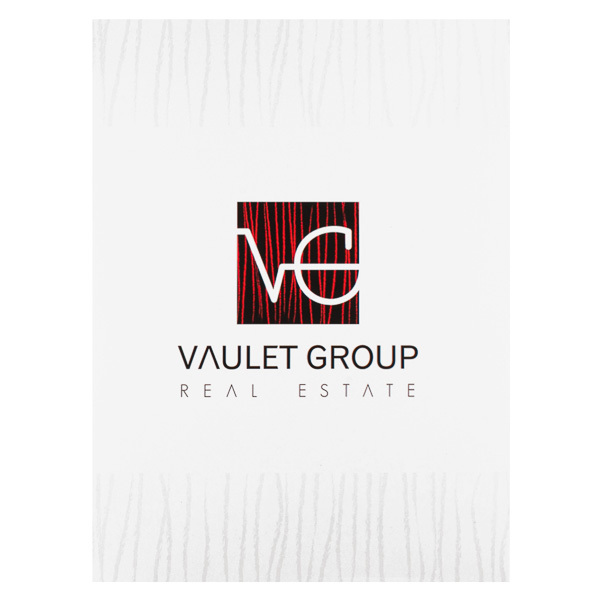 Off-kilter red slashes on a black backdrop create an edgy, energetic logo for Vaulet Group Real Estate. These lines are printed in pale gray at the top and bottom of the cover to balance the logo in the center. Its quirky sans serif font lacks crossbars in the letter "A," showcasing the brand's cool, modern personality. Burgundy stripes and contact information adorn the left pocket, while a light VG logo is just visible at right. The back cover's RE/MAX logo reveals the parent company for Vaulet. Four-color process printed on Side 1 of 12pt C1S White Semi-Gloss stock. Coated with Aqueous Gloss. H2 business card slits on right pocket. 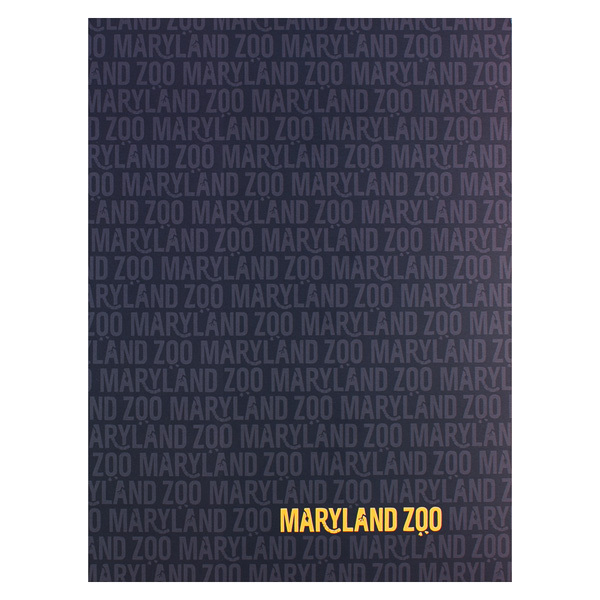 The repetition of the Maryland Zoo’s logo in this gray on black design creates an elegant, playful way to introduce visitors to the facility. The splash of yellow brings cheer to an otherwise neutral cover. The subtle use of animal body parts in the text reminds customers of the animals at the zoo; the pattern itself even looks like an animal's spotted fur. Inside, customers take a walk on the wild side with the mysterious amphibian foot on the left pocket. The most popular style in the U.S. and one of our best sellers, this product is a classic for a reason. Its two interior pockets securely hold 8 1/2" x 11" documents. Square corners are die-cut with careful precision to create a crisp, clean exterior. The combination of traditional size and distinctive shape communicate a sense of professionalism and poise to recipients, while the customizable exterior and interior panels allow you to spice up your design with your company's logo, relevant text, or even full-color imagery.